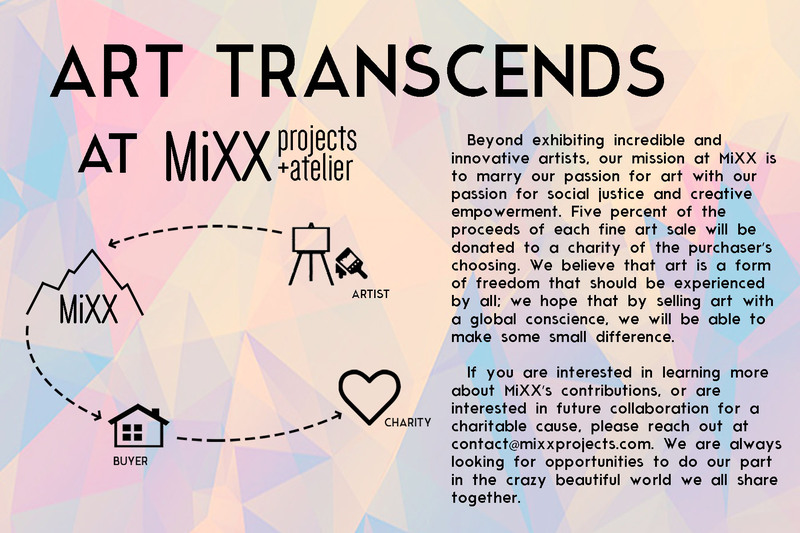 Beyond exhibiting incredible and innovative artists, our mission at MiXX is to marry our passion for art with our passion for social justice and creative empowerment. Five percent of the proceeds of each fine art sale will be donated to a charity of the purchaser’s choosing. We believe that art is a form of freedom that should be experienced by all; we hope that by selling art with a global conscience, we will be able to make some small difference. If you are interested in learning more about MiXX’s contributions, or are interested in future collaboration for a charitable cause, please reach out at contact@mixxprojects.com. We are always looking for opportunities to do our part in the crazy beautiful world we all share together. For questions or pricing information, please contact the studio.